This model is the Dinky 22e-G Farm Tractor in green with a yellow upper body and red wheels. 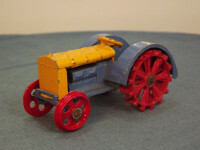 It is an original casting, with new paint scheme and reproduction wheels. This paint scheme does not appear in any references that I can find. The model features a two piece cast body with cast wheels. The yellow upper body casting represents the radiator, steering wheel, seat and tow hook. The lower body casting has the engine and rear wheel guards. The base plate is actually part of the lower body casting and is green painted metal. It is marked with "Meccano" at the top centre and "Dinky Toys at the centre bottom. 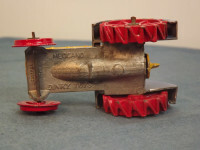 It is fixed to the upper body casting via a body locating lug at the front and the rear axle at the rear and possibly a ground down screw just forward of the rear axle. 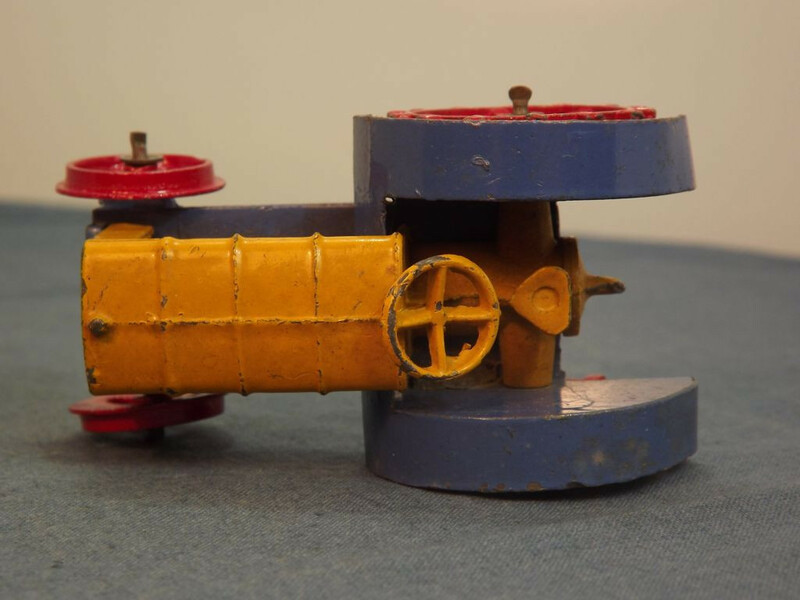 All wheels consist of solid cast metal, painted red, on steel axles. 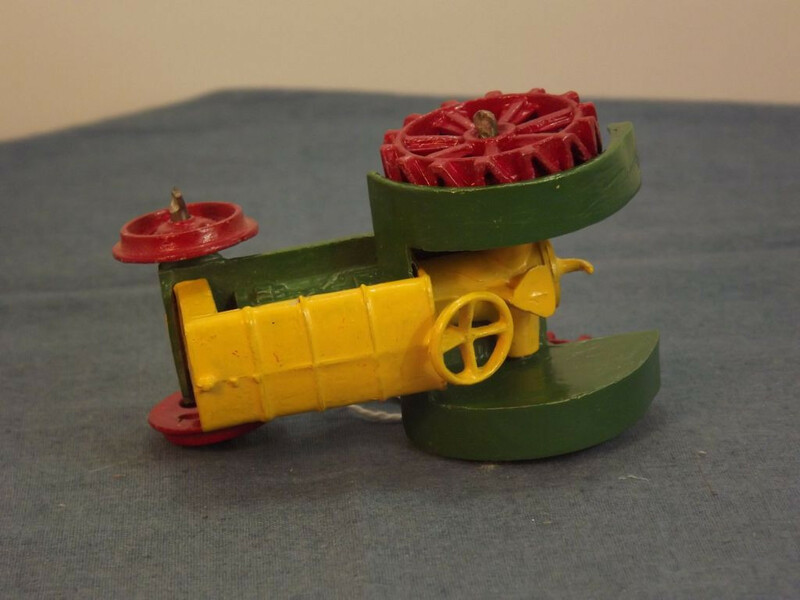 On this model both the two front wheels and, possibly, the two rear wheels are reproduction parts. This casting was issued between 1934 and 1941 - I do not know when this restoration was done. 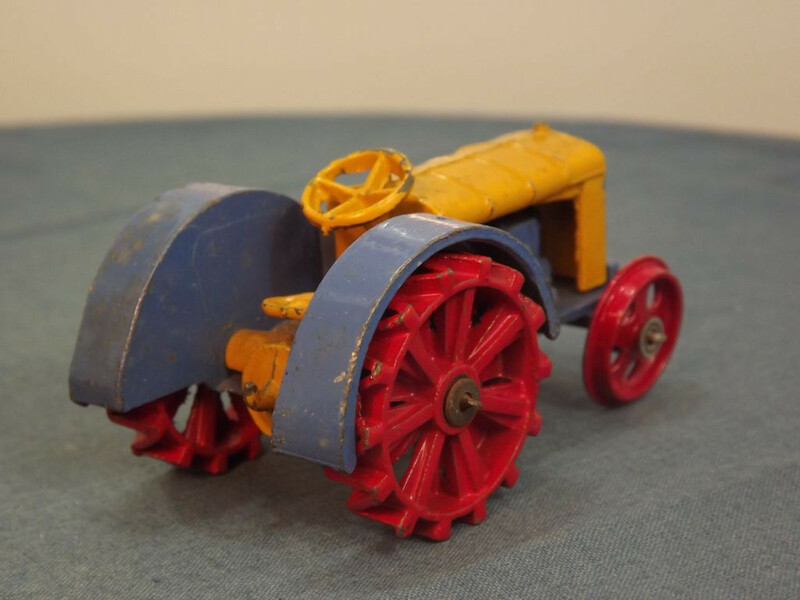 This model is the Dinky 22e-G-2 Farm Tractor in blue with a yellow upper body and red wheels. 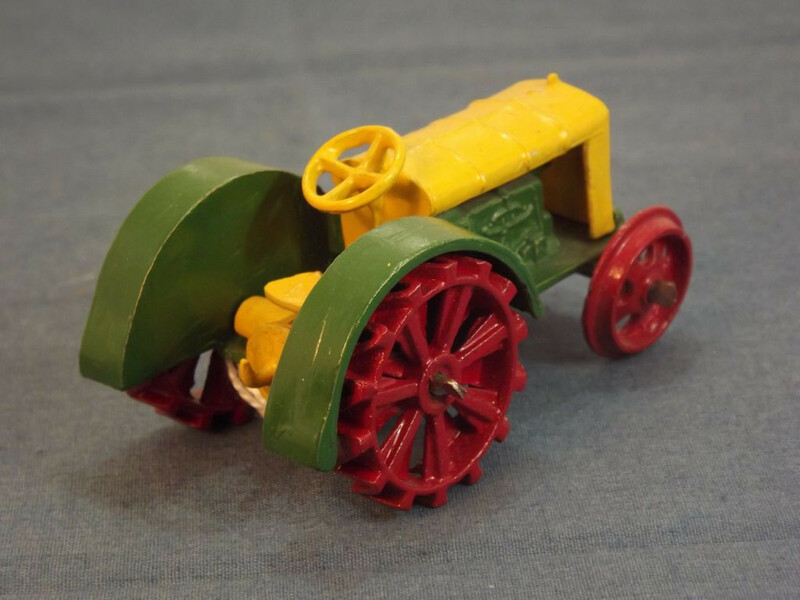 It is an original casting, with original paint but with reproduction front wheels. The base plate is actually part of the lower body casting but is unpainted metal. It is marked with "Meccano" at the top centre and "Dinky Toys at the centre bottom. It is fixed to the upper body casting via a body locating lug at the front and the rear axle at the rear. All wheels consist of solid cast metal, painted red, on steel axles. 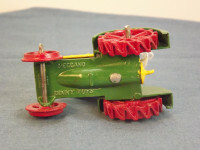 On this model the two front wheels are reproduction parts. 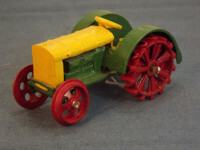 This model was issued between 1934 and 1941.